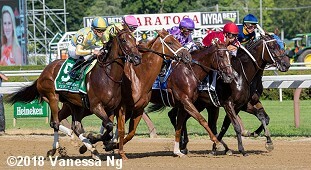 The feature race on the first Sunday of the Saratoga meeting is the $300,000 Coaching Club American Oaks (G1), featuring some of the top 3-year-old fillies going 1 1/8 miles, one complete lap of the main track before 26,208 fans under sunny skies and temperatures in the mid 80's. 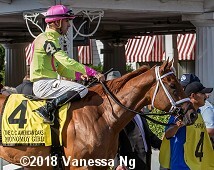 Just 5 made final entry, with Monomoy Girl sent off as the 1-2 favorite, winner of 4 straight including the Kentucky Oaks (G1) and Acorn Stakes (G1). 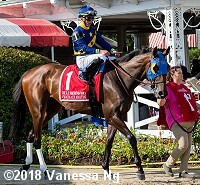 In to challenge her included 7-5 second choice Midnight Bisou, winner of the Santa Anita Oaks (G1) and Mother Goose (G2) but third in the Kentucky Oaks, and 15-1 third choice Eskimo Kisses, 4th in the Kentucky Oaks after finishing 2nd in both the Fair Grounds Oaks (G2) and the Ashland (G1). Jockey Florent Geroux sent Monomoy Girl to the lead first time by and she set fractions of 24.12, 48.23, and 1:12.43 while pressed by 25-1 Gio Game and stalked by Midnight Bisou. Entering the stretch, Gio Game tired as Monomoy Girl continued to lead through 1 mile in 1:37.57. Kept to task by Geroux, Monomoy Girl drew off late to win by 3 lengths over Midnight Bisou in 1:50.46 over the fast main track. It was another 3 1/2 lengths back to 43-1 longest shot Chocolate Martini third. 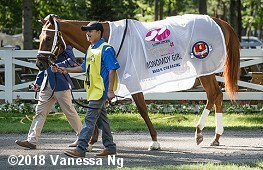 Left: Monomoy Girl in the winner's circle. Winning trainer Brad Cox said, "I put this race up there as high any of her other Grade 1 wins this year. It wasn't a big field, but it was 1 1/8. I think there's a still a question mark if that's her best distance, but she proved today that she can do it. She's got speed and puts herself in the race. The fractions were great up front, when I saw the 48 flat, I don't think she's ever went that slow. I can't recall. She certainly brings it every time. At the quarter-pole, I was very confident. I told Florent to ride her with confidence but ask her to leave [the gate quickly]. That's the only thing I told him. We knew she's comfortable on the lead. Around two turns, I think we can do that. One turn, she can sit off a horse or two but ultimately that depends on how much other speed is in the race." 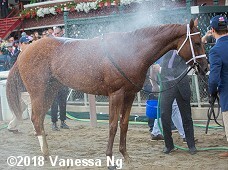 Right: Monomoy Girl gets hosed off after the race. 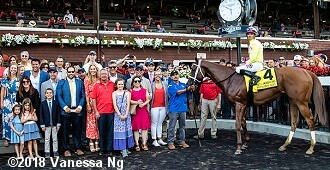 Winning jockey Florent Geroux said, "I thought that I had the best horse coming into the race and I rode her like she was: take no prisoners, just take it to them right away and keep on going. Sometimes, she'll put the brakes on by the 3/8 pole, looking around and slowing herself down. Today, she stayed a little bit longer, maybe all the way until the eighth pole and at the end, she was really waiting on company. That's why the margin is never going to like 15 lengths, but I had a plenty in the tank." Left: Monomoy Girl in the paddock. Geroux added, "She was a little more focused. I think she's maturing very nicely. She was a little more focused through the end. She's always going to look around a little bit, just because that's who she is, but she's doing it a lot straighter than she used to. No doubt she's getting better. Mentally and physically, she's growing into a very nice filly. 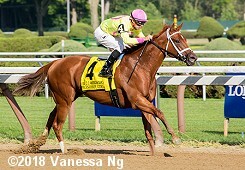 It looks like the owner has already discussed keeping her training as a 4-year-old, which would be amazing for myself." Right: Monomoy Girl heads out for the post parade. Cox added, "The Alabama is certainly a possibility. 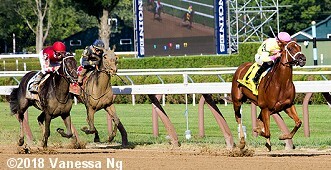 It's probably two more races this year, one more and then the Breeders' Cup [Distaff]. We'll let her determine where we are with her in terms of races. If today's race was 1 1/4, I would have been confident with her coming in going another 1/8 mile. The Cotillion is also under consideration. It's a big purse and a Grade 1 as well. She is here, it'd be nice to run her out of her own stall, but she's capable shipping which she's done many times. We'll just let her determine where we are. She's not regressing, she gets bigger, stronger, shinier every race." Left: Second place finisher Midnight Bisou returns after the race. Jockey Mike Smith said, "We didn't really go that fast early, and I said, dang it. I really couldn't do anything, I wasn't in a situation to do anything about it. First of all, I was down inside. They all broke, and I mean, they're just quicker than she is, and I thought it would be crazy to do something silly. I gave her every chance. I took her down the backside and tried to push the pace just a little bit to see and make sure at least it was honest enough and I thought it was. Today, she just got the best of us. We got to figure out how to turn the tables." Right: Third place finisher Chocolate Martini heads out for the post parade. The Tom Amoss trainee improved her record to 3 wins, 0 seconds, and 3 thirds in 10 starts, earning $365,936 for owners Double Doors Racing and Nine Thirty Racing. 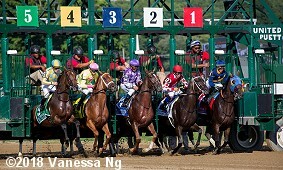 Left: The fillies break from the gate for the Coaching Club American Oaks. Right: Shortly after the start of the race.